A mile to the north east of Tavistock town centre, in the grounds of Kelly College, is a late Iron Age earthwork known as the Trendle. This was the site of the first known settlement, a small Celtic community which may have still existed when the Saxons reached the area, for it lies above the Walla Brook (Welshmen’s brook) indicating that the new colonists found an indigenous community of Britons in this valley. Those colonists ‘occupied the lower ground beside the brawling Tavy, and founded the stoc that gives the place its name’ (Hoskins), settling there in the early seven hundreds. For over two centuries this would have been a small and secluded hamlet with its own chapel. The town of Tavistock ‘is essentially the product of its two owners: Tavistock Abbey from the tenth century to the sixteenth, and the Dukes of Bedford from the sixteenth to the twentieth. The Abbey created the town; the Russells gave it its present appearance and character’ (ibid). The Abbey was founded by Ordulph, brother-in-law of King Edgar, in c974, its dedication being to an obscure sixth century monk and (? )bishop, Rumon. The founder arranged ‘the translation of Rumon’s relics from Ruan Lanihorne, a Celtic monastery and the most ancient centre of his cult, to Tavistock’ (Farmer). Little more than two decades later the young foundation was to receive a severe shock – the Danes were on the rampage, and in 997 ‘raided both in Cornwall and in Wales and in Devon … turned into the mouth of the Tamar, and then went up until they came to Lydford, and burned and killed everything that they met, and burned down Ordwulf’s monastery at Tavistock and brought indescribable war-booty with them to the ships’ (Swanton). The Abbey, however, recovered from this set-back and would become ‘the largest and wealthiest in the South-West’ (Hoskins). 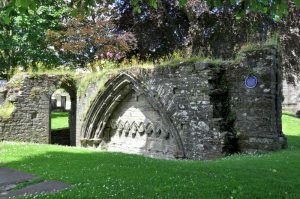 The Abbot obtained a market charter from King Henry I in 1105 and later in the century, ‘probably during the abbacy of Walter (1155–68), the final step was taken of detaching some 325 acres from the vast rural manor to set up a borough’ (ibid). The discovery of what proved to be the largest European source of tin on the south western edge of Dartmoor contributed to the growing prosperity of the little town which became one of the stannary towns in 1305, alongside Ashburton and Chagford, ‘where all tin raised in Devon was to be weighed, stamped and put on sale’ (ibid). The parish church, a late perpendicular building with an outer south aisle, the Clothworkers’ Aisle, is ‘on the large scale which befitted the prosperity of the Tavistock cloth trade’ (Cherry), which prospered as tin-mining. The abbey church, which lay immediately to its south was about a third longer, but of this great thirteenth century edifice, merely fragments remain, to remind us, with those few domestic buildings which survived, of the grandeur of the pre-dissolution establishment. In 1539 the Abbey was suppressed: John Russell from Dorset, who had risen in the service of King Henry VIII to become Comptroller of the Household, was granted the abbey itself and ‘most of its possessions, both temporal and spiritual’ (Hoskins). This was only part of his vast accumulation of former monastic estates which, ‘to support his viceregal authority as President of the Council in the West, was on a princely scale’ (ibid). In the same year he became Lord Russell and was made Earl of Bedford in 1549. A successor was to become Duke of Bedford, but the secondary title, used as a courtesy title by the ducal heir, Marquess of Tavistock, recalls the reward of the abbey estate given to the founder of the family‘s fortunes. ‘The Devonshire tin trade had practically disappeared by the early seventeenth century, but by then the ancient cloth industry of the town had become considerable and decay was averted. When in turn the cloth trade decayed, from the early eighteenth century onwards, copper-mining developed opportunely to take its place’ (Hoskins). These three industrial phases, one succeeding the other for around 750 years meant that, ‘unlike most urban areas in the county, it had a steady history of prosperity’ (Cherry). The population which was three and a half thousand in 1801 had risen to almost nine thousand in 1861, during the boom years of copper mining. In that period the Dukes had taken a hand in shaping the developing town, restoring the few surviving relics of the Abbey and adding other public buildings in the centre, laying-out a suburb of genteel villas to the south and building a total of around three hundred miners’ cottages in several groups , ‘the standards were high for the time and impressed contemporary commentators’ (ibid). A canal was built to transport the ore to the navigable Tamar at Morwellham early in the nineteenth century. 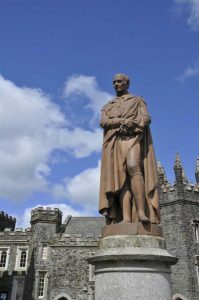 Tavistock’s most famous son, Sir Francis Drake (1541–96) was probably born at Crowndale, a mile to the south of the town centre, where his grandfather John Drake rented the farm from Lord Russell, working it with his son Edmund. As well-known Protestants their position was precarious when the Westcountry Prayer Book Rebellion broke out in 1549 so they fled to the safer haven of Plymouth and later moved to Kent. 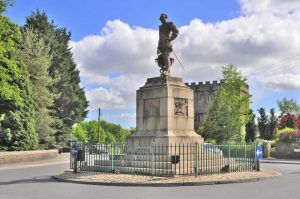 ‘The rich Devonian speech that was never to leave him even in the years of prosperity and fame’ (Burton) was retained from his childhood in Tavistock, where his statue stands at the south end of the town. The railway reached Tavistock in 1859 and, as mining production fell by the end of the nineteenth century, the canal was abandoned and the quays of Morwellham fell silent. The Plymouth to Exeter line via Tavistock, Okehampton and Crediton has recently received the attention of transport planners and politicians as a possible alternative to the vulnerable coastal route of the old GWR, but would need to be re-instated west of Dartmoor as it was a victim of the Beeching cuts.